Vernacular residential architecture lining Leffingwell Street in the district. 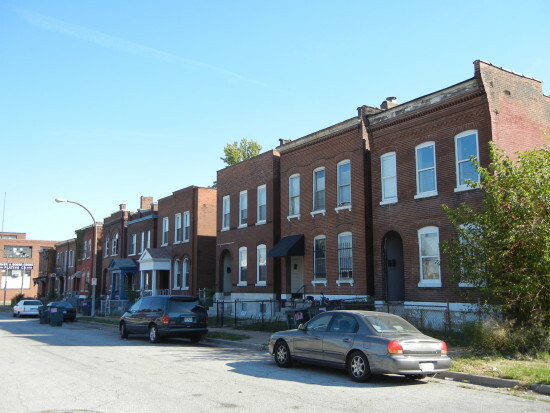 The Yeatman Square Historic District represent Preservation Research Office’s approach to “right-sizing” in a depleted neighborhood: focused on conserving assets by creating a historic narrative that is inclusive of several layers of the past rather than focused on origins. 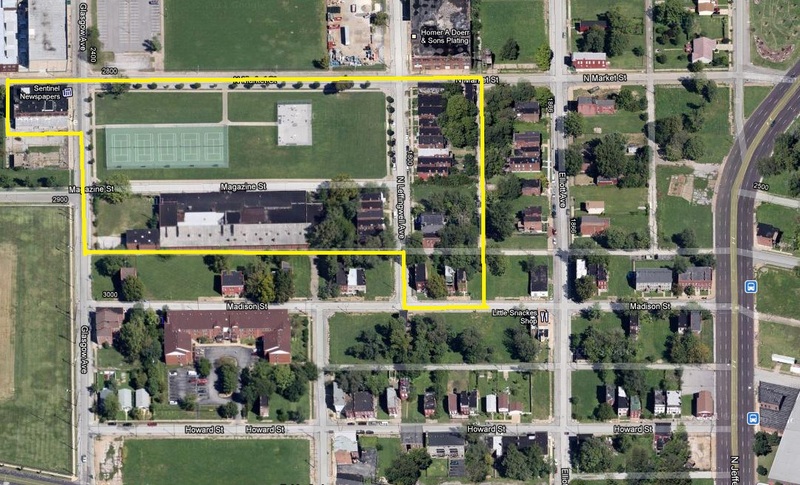 If we looked at the area as a 19th century neighborhood, we never would have gotten it listed. By treating early urban renewal and later industrial development as equally significant — which it is — we drew a period of significance long enough to make a district. Unfortunately existing National Register standards of “integrity” precluded a larger boundary. Aerial view of the district shows that it is the only really contiguous section of a larger area. Alas, the National Register’s integrity standards are hostile toward such depleted landscapes. Ultimately, this boundary will direct housing reinvestment in the JeffVanderLou neighborhood in conjunction with the Northside Regeneration project. The buildings inside the district will be eligible for historic tax credits closing financial gaps that previously precluded their rehabilitation. JeffVanderLou will preserve one of its strongest and most intact settings as a cornerstone for 21st century growth. PRO Director Michael R. Allen wrote the historic context while Carla Bruni prepared the inventory. PRO completed this work under contract to Lafser & Associates. The Yeatman Square Historic District is approximately three miles northwest of the Mississippi River at downtown St. Louis. 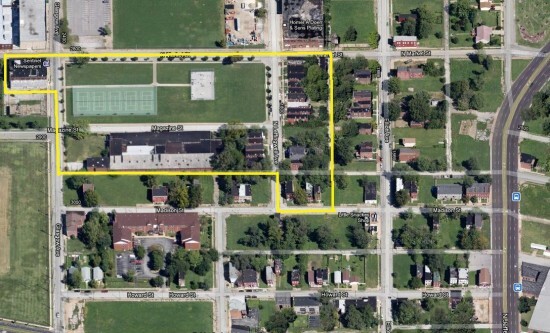 Yeatman Square is part of a compact neighborhood located on the near north side bounded by Glasgow Avenue, North Market Street, Magazine Street, and Leffingwell Avenue. The District is primarily residential in character, its housing stock consisting of buildings built well before 1920, and about 80% of these structures are multi-family flats of brick construction. The boundaries of the Yeatman Square Historic District reflect a contiguous portion of the neighborhood that has maintained much of its architectural integrity and planning history. 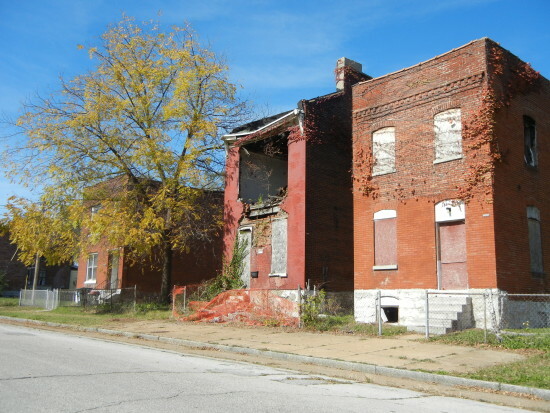 Some of the Yeatman area has been lost to demolition, but many homes of the original residents remain, and have retained their architectural integrity. The nominated District includes the Yeatman Square, completed in 1908 to the designs of Henry Wright and George Kessler, as well as a surrounding built environment that includes two Modern Movement industrial buildings built in 1940 and 1943 and 19 residential buildings built between c. 1879 and 1910. The District is the fulfillment of local advocacy of City Beautiful ideals in park planning that included a program for creating playgrounds in the dense urban neighborhoods east of Grand Avenue in the city. Houses on Madison Street in the district show the range of conditions and the need for investment. In 1906, the city issued bonds to build five small neighborhood playground parks, of which Yeatman Square Park is the sole surviving park in its original location and size. The District embodies both the promise of early progressive planning projects in the city as well as the reality of rapid twentieth century changes in the older neighborhoods in the eastern part of the city. Architecturally, the houses in the District represent a common range of materials and styles. All are built in brick masonry, and almost all are flat roofed two-story buildings. The buildings employ some ornament in porch construction, use of ornamental brick, terra cotta and stone elements, and tin and wooden cornices. None have elaborate decoration, or strongly pronounced connections to well-defined architectural styles. All of the District’s residential buildings embody the vernacular characteristics of Late 19th and 20th Century American Movements. 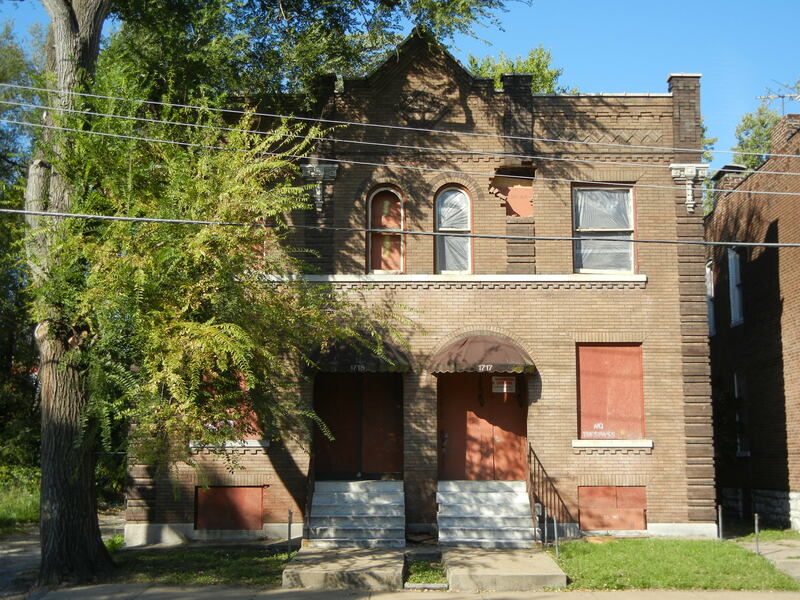 District resident August Winkel was particularly active in development of the multi-family buildings in the block of Leffingwell Avenue between Madison and North Market streets. His own residence at 1812 Leffingwell Avenue is his most stylistically refined work. Professional architects also designed some of the contributing residences in the District including Ernst Preisler and Gerhard Becker. The beautiful four-family dwelling at 1715-17 N. Leffingwell Avenue dates to 1908 and was designed by architect Ernst Preisler. The 1904 Louisiana Purchase Exposition introduced St. Louisans to the landscape architecture ideals of the American City Beautiful movement: open vistas framed by grand buildings, employment of picturesque grading and plantings and a concern for the benefits of public experience of the outdoors. Locally, the chief proponent of these ideals was landscape architect and planner George E. Kessler, who had designed the landscapes at the World’s Fair. Kessler hired Wright to manage the St. Louis office of George Kessler & Company. Through this position, Wright would become designer of Yeatman Square and many other local projects. After 1904, Kessler and Wright became prominent and eloquent advocates for park planning in St. Louis. Both men urged the city to develop new parks in crowded neighborhoods, create playgrounds for children, and develop beautiful park-like boulevards in the outer ring of the city to encourage good development. To Kessler and Wright, open space was about more than spatial organization – it was the necessary condition for developing a healthy democratic public. Their words showed an optimistic belief that alleviating urban overcrowding through park creation would aid in efforts to overcome the effects of poverty. Parks Commissioner Henry C. Scanlan secured the site for what would become Yeatman Square early in 1907, and the permit for demolition of the block is dated April 10, 1907. Yeatman (1818-1901), a St. Louis banker and philanthropist, is believed to be the origin of a character in Winston Churchill’s novel The CrisisYeatman was well known in St. Louis, and founded the National Bank, later called the Merchants National Bank. He was connected to countless public enterprises and reforms, and was a Union sympathizer during the Civil War and part of a commission sent to Washington to explain local affairs to President Lincoln. Yeatman was also the first President of the Western Sanitary Commission, as well as the Mercantile Library Association, and was instrumental in building Washington University. Yeatman Square today is rather modest in appearance but offers tennis courts and public open space. Wright’s plan for the 3.23-acre site was fairly simple. He sloped the site’s edges upward to form a level central area, mostly of which was lawn space open for children’s’ play. In the center of the park, was a small irregularly-shaped lake, with a scenic bridge as an attraction designed to appeal to children. There was a wading pool, which was the city’s first. Some paths connected to the edges. Largely, Yeatman Square was designed to maximize open play space and open views of the surrounding neighborhood. In 2003, the city built the basketball and tennis courts as well as the paths that are now found in the park. At the same time, the city planted new trees in the tree lawns on the north, east and west sides. 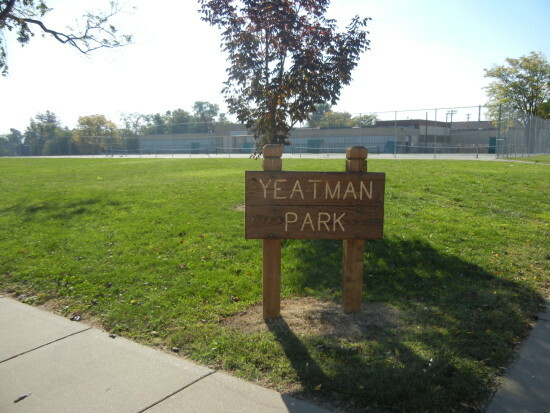 The Parks Department also changed the name from Yeatman Square to Yeatman Square Park (sometimes written as simply “Yeatman Park”). Today, the landscape is devoid of plantings within the park, appearing much as it did in 1958 after city clearance of the temporary veterans’ housing. Yeatman Square Park is surrounded on one face by vernacular housing from the 19th and early twentieth century, and on its other sides by industrial facilities from the middle to late twentieth century. Sterling Aluminum Products Company, a manufacturer of piston rings, built the district’s two manufacturing buildings. 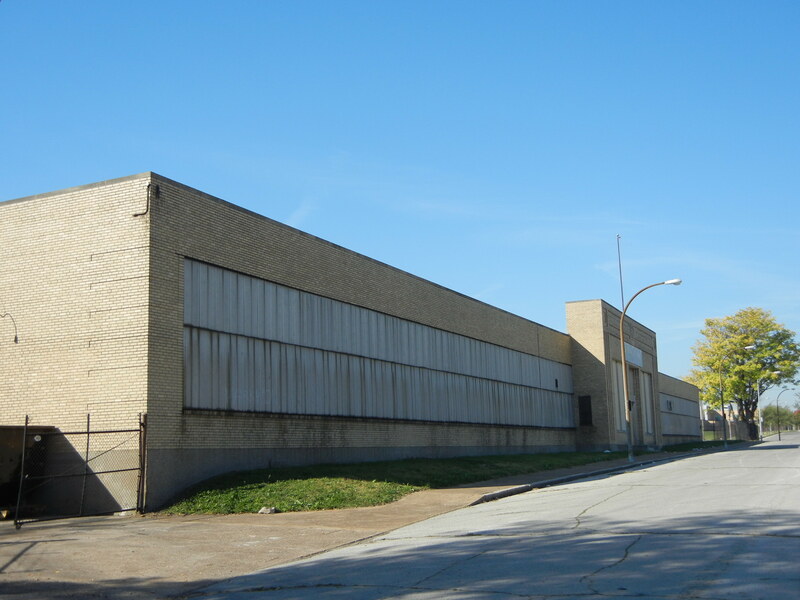 The one-story foundry at 2830 Magazine Avenue faces Yeatman Square and dates to 1943. Today, the remaining Sterling buildings in the District are the only industrial buildings in this group that have retained their historic visual relationship with the Yeatman Square landscape. The others have been or will be demolished, or are separated from the park by buildings with major integrity problems. The Sterling buildings demonstrate the period between 1930 and 1951 in which Yeatman Square’s built environment was altered through industrial development. The landscape remains an excellent example of the transition between the earlier walking neighborhood and the truck-serviced industrial landscape of the mid-century city.